Unlike other aromatherapy patches on the market that usually contain a mix of 2 or 3 essential oils; our Altacura Vapour patch, by Alta Care Laboratoires, is composed of 6 different essential oils: Mentha Piperita, Pinus Sylvestris, Eucaliptus Globulus, Eugenia Caryophyllus, Citrus Dulcis, Citrus Limonum. Aromatherapy is the art of healing with essential oils for the harmonization of health, it’s also one of the best and safest treatments for children. The combination of several essential oils is important to create precious and very effective elixirs against several ills. Many doctors and pharmacists use it as a first line treatment in children with nasal congestion. Our combination of various active ingredients allows our product to be highly effective in case of a congested nose and other cold symptoms; all at a price equal to or inferior to competing products on the market. Indeed, it is important for us to provide high-quality products at a price accessible to all. 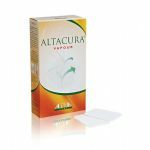 Start your aromatherapy cure with Altacura vapour patch as a first line treatment, for you and your children.